Happy Wednesday everyone! I hope all my fellow Canadians had a spectacular Victoria Day weekend. Hoping that all my American friends are gearing up for a great Memorial Day weekend. Use the long weekend to spend time with your family, friends and loved ones. Try not to spend the day at work, fretting over lineups and Fantasy Football mock drafts like I did. One small blurb about a player I mentioned last week. Jake Arrieta has one of his best starts of the season on Sunday, giving up just one (unearned) run in six innings against the Brewers. On the surface, it looks like Arrieta is starting to turn his season around but I’m not too sure. His mechanics were all over the place and he looked very wild at times. Specifically, his release point was inconsistent and his delivery didn’t look repeatable. I’m waiting for couple more starts before I say that he’s back. On to this week’s Stock Report. Travis did not start this season the way he envisioned. Granted he was working his way back from a knee injury but his April was incredibly ugly. 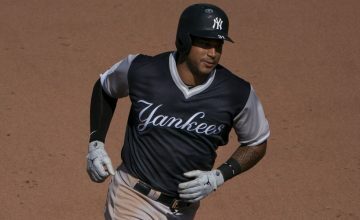 In 21 April games, Travis slashed .130/.193/.195. He hit just one home run and drove in five RBI while being moved all over the lineup in an attempt to get him going. Since the calendar flipped to May, Travis has been a completely different player. In 18 May games, Travis is slashing .369/.382/.631 with 10 runs and 10 RBI. He’s only hit one home run, but he’s made up for it by hitting 14 doubles. Yes, I wrote that correctly. 14 of Travis’ 24 hits this month have been doubles. He’s had six multi-hit games since May 14th and has raised his average over 100 points this month. His BB% and K% are nearly identical to last season, while his LD% is higher than last season. If his .286 BABIP regresses closer to his .341 career average, Travis should continue to produce in the middle of the Jays lineup. Following his awful start, Travis was dropped en masse and now sits at 16.7% ownership in ESPN. If he’s available, anyone looking for help at middle infield should take a flier on him. What can be said about Dickerson’s incredible run? Over the last week, Dickerson has hit six home runs and driven in 10 runs while getting on base at a .464 clip. For the season, Dickerson is hitting .337 with 12 home runs, 23 RBI and 31 runs scored. His second season in Tampa is going much better than his first, as his hard hit % just jumped over six percent. He is also hitting the ball all over the field, a great sign that he’s letting the game come to him instead of forcing the ball to his pull side for more power. Dickerson’s success against left-handers is a big part of his success this year. A career .262 hitter against southpaws, Dickerson is hitting .365 against them this season. It’s only been 52 at-bats but it shows a huge step forward for the former Rockies outfielder. There is obviously some regression in store, but Dickerson is starting to establish himself as one of the best up and coming power hitting outfielders in the Majors. He’s still not universally owned in ESPN leagues so everyone should take a quick look at their waiver wire. 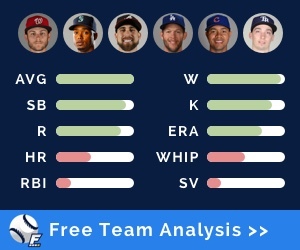 Ross has always had the potential to be a solid middle of the rotation pitcher in Fantasy and for the Nats. This season, Ross struggled as his arm slot had changed, causing him to fatigue early in his starts. The altered arm slot also decreased the effectiveness of his slider, making it tough for him to put batters away. In an attempt to fix his issues, Washington sent him down to Triple-A. 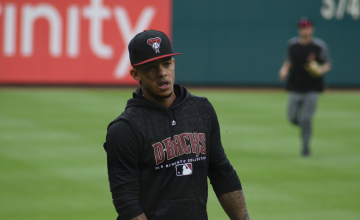 After a month in the minors, Ross was recalled to start against the Mariners on Tuesday, and looked like made some serious improvements. Ross pitched eight strong innings on Tuesday, giving up one run on five hits while striking out six batters in an easy victory. His stuff looked much improved, albeit against a weakened Seattle lineup. Ross has seemingly earned another start and will have a relatively easy matchup against the Padres on Sunday. Owners in need of a flier with decent upside should make the add as soon as possible. Herrera was a popular mid-round pick in 2017 drafts after he showcased solid power/speed skills last season. 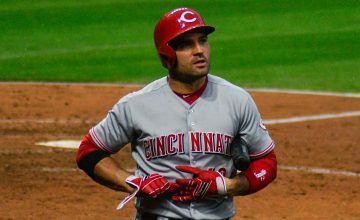 An increased walk rate and decreased strikeout rate were catalysts for Herrera putting up a .361 OBP in 2016. This season, Herrera has fallen back into bad habits, striking out more and walking less than he did last season. Over his last 15 days, Herrera has just one RBI and one run scored, getting on base at a horrendous .181 clip. It’s tough to nail down a single culprit for his struggles, but a .294 BABIP is a good start. That mark is below average for Herrera who put up a .349 mark last season, and a .387 BABIP in 2015. Once that regresses closer to his career average, his .232 average should see a boost. Even if his average comes up a tick, Herrera is still struggling to steal bases. In seven attempts this season, he’s been caught three times and has just two steals in the last month. If he starts to hit again, Herrera will make for a decent bench bat. But he will need to pick up contributions in the HR and SB department to be a useful everyday option. Cutch has been in a steep decline for a couple years, but it’s gotten to the point where its tough to roster the former NL MVP. Through 45 games, McCutchen is barely above the Mendoza line with a .201 average. His BABIP is way down at .222 but there are underlying reasons for his poor mark. The most glaring is his batted ball profile. This season McCutchen has seen his GB% increase by seven percent, while his LD% has taken the entirety of the 7% dip. With McCutchen’s injury history, it’s not surprising that he can’t overcome an influx of grounder with his declining speed. 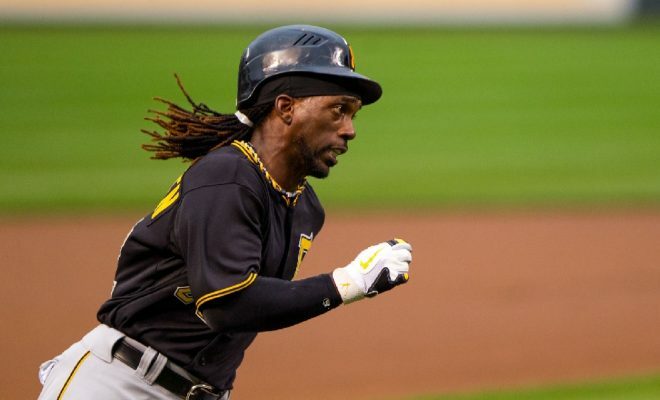 McCutchen’s struggles can be attributed to his inability to hit right-handers. He’s slashing just .163/.224/.244 against RHP this year, a drastic decline from his career .281/.371/.463 line against righties. On the bright side, Cutch has seen a bump in stolen bases, as he’s 5-for-6 this season, where he finished 6-for-13 last season. McCutchen’s decline has been drastic and very quick. His ability to hit for average has declined every year since his MVP season and shows no sign of improving. The Padres’ closer started the season very well, racking up four saves and posting a 2.03 ERA through May 8th. Since May 11th, Maurer has given up 10 earned runs in 3.2 innings. Through those five appearances, Maurer has blown two saves and his ERA has risen to 6.88 as a result. As horrible as he’s been in the last two weeks, there has been no indication that Maurer is in danger of losing his job. With the way he’s performing lately, the Padres may be subject to a few more blown saves before Maurer rights the ship. His .400 BABIP is due for some regression, meaning the ERA should fall under six soon enough. His 51.9% strand rate and HR/FB of 18.2 support the idea that Maurer is better than his ERA suggests. His 2.68 FIP and 2.26 xFIP also show he’s run into some bad luck over the lat couple weeks. Regardless, Maurer has not been effective, and he’s likely one or two bad appearances from losing the ninth inning. When Carter Capps returns from the DL he will take over as closer in short order.